Pennsylvania is one of the 50 states in the United States of America. It is in the northeastern part of the country. It has a border with Ohio on the west, West Virginia on the south and west, Maryland and Delaware on the south, New Jersey on the east, and New York and Lake Erie on the north. The state capital of Pennsylvania is Harrisburg. The largest city in Pennsylvania is Philadelphia. The state nickname of Pennsylvania is "The Keystone State". The current governor of Pennsylvania is Tom Wolf. Pennsylvania is well known for its role in the American Revolution, its large communities of Amish, and its heavy industry. Pennsylvania was home to many Native American groups before Europeans settled there. These include the Delaware, Susquehanna, and Iroquois. The first European settlers in Pennsylvania were from Sweden. They arrived in 1643. The area was later ruled by the Netherlands and Great Britain. In 1681, Charles II of England, gave the land to William Penn. Penn used the land to create a home for Quakers. The land became known as "Penn's Woods", as Pennsylvania has many forests. In Latin this is "Pennsylvania". This became adopted as the name of the colony. Meanwhile, in the western part of the state, armies from France and Great Britain fought for control of the source of the Ohio River. This conflict was part of the French and Indian War. Great Britain eventually won the conflict for this location and built a fort called Fort Pitt. The fort grew into a city which is now called Pittsburgh. The state of Delaware was once part of Pennsylvania. In 1704, Delaware formed when three Pennsylvania counties left the colony and created their own government. Pennsylvania was one of the 13 colonies that fought Great Britain in the American Revolution. The United States Declaration of Independence was signed in Philadelphia. Benjamin Franklin, an important figure in the Revolution, was also from Philadelphia. Pennsylvania was the second state to join the United States. Philadelphia was capital of the United States before Washington, D.C..
Later, Pennsylvania became an important center of industry. Kerosene was discovered in Titusville in the 19th century. This was the start of the oil industry in the United States. Large deposits of coal were found in and around Pittsburgh. This caused Pittsburgh to become a major industrial city. Industry began leaving Pennsylvania in the late 20th century, because most heavy industry was being transferred to other nations. Many people left, too. It also caused many of its cities and towns to decay. Most of Pennsylvania is part of the Appalachian Mountains, including the south central and northeastern areas of the state. Much of the rest of the state is very hilly, partly due to the closeness to mountains and partly due to the steep river valleys in the state. The Monongahela, Allegheny, and Ohio rivers are in the western part of the state, and the Susquehanna is in the central part of the state. The northwestern and southeastern parts of the state are mostly flat and low-lying. Pennsylvania is the 33rd largest states in the United States, with a land area of 44,817 square miles. The highest point in the state is Mount Davis, at 3,213 feet above sea level. The lowest point is the Delaware River, which is at sea level. Pennsylvania is the 6th most populated state. In 2000, there were 12,281,054 people. More than half of the people live in the areas of Pittsburgh and Philadelphia. Few people live in the north central area of the state. Towns and cities tend to be small in size and densely populated, more so than in other states. This is because many of the towns and cities in Pennsylvania were built around a specific factory or factories. Pennsylvania has many colleges and universities. Officially, the state's public university is Pennsylvania State University. Best known are a few private university systems which are partially (around 10%) funded by the state, like University of Pittsburgh. The state's most well-known private university is the University of Pennsylvania, an Ivy League institution. Pennsylvania also has a number of state run colleges in Bloomsburg, California, Cheyney, Clarion, East Stroudsburg, Edinboro, Indiana, Kutztown, Lock Haven, Mansfield, Millersville, Shippensburg, Slippery Rock, and West Chester. Those fourteen schools make up one of the largest state run higher education systems in the country. Other significant private universities are Carnegie-Mellon University, known for its computer science research, and Bucknell University. 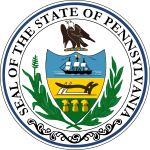 Wikimedia Commons has media related to Pennsylvania. 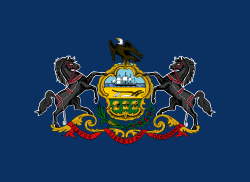 ↑ "Symbols of Pennsylvania". Portal.state.pa.us. Retrieved May 4, 2014. ↑ 4.0 4.1 "Elevations and Distances in the United States". United States Geological Survey. 2001. Archived from the original on October 15, 2011. Retrieved October 24, 2011. ↑ "Cookie Candidates". 2016. Retrieved February 22, 2016. This page was last changed on 31 January 2019, at 14:01.